In this informative Q&A that addresses common misconceptions related to mental health concerns during the holidays, Lisa Furst, LMSW, MPH, Assistant Vice President of the Center for Policy, Advocacy and Education at Vibrant Emotional Health, makes recommendations and provides supportive resources that will help you and your loved ones remain emotionally healthy this season. 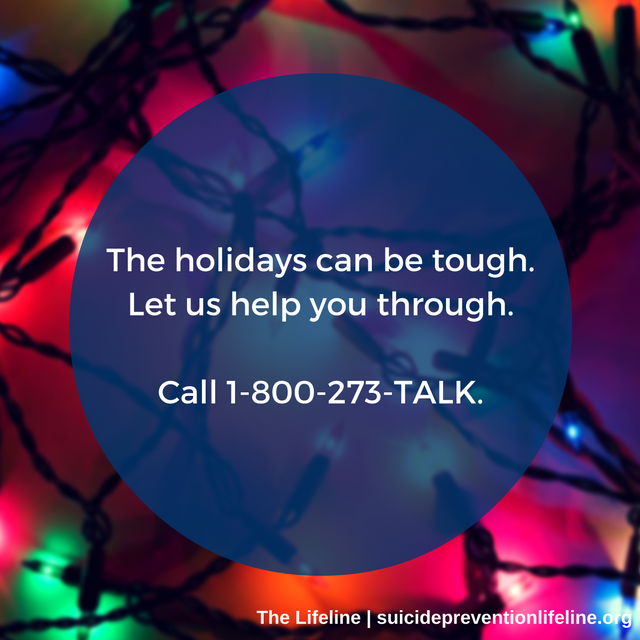 Q: Is it true that people are more at risk for suicidal thinking during the holiday season? A: We commonly hear that people may be more at risk for suicide during the holidays; however, research does not support this idea. While it’s true that the holiday season may be particularly stressful for some people if they are socially isolated, experiencing conflicts in important relationships, dealing with financial challenges, or experiencing other psychosocial stressors, we do not typically see an increase in suicidal thinking during the holidays. Regardless of the season, anyone experiencing emotional distress or thoughts of suicide should reach out for support by calling the National Suicide Prevention Lifeline at 800-273-TALK. Q: I’ve heard that sometimes people feel more depressed in the winter. Can you tell me more about Seasonal Affective Disorder (SAD)? A: Seasonal Affective Disorder (SAD) is a type of depressive disorder in which people with the condition experience the symptoms of major depression, but usually during the times of the year when natural sunlight is diminished, such as in the autumn and winter months. People who are diagnosed with SAD can benefit from antidepressant medications and psychotherapy to alleviate their symptoms; additionally, people experiencing SAD may also benefit from increased exposure to light using a light box during the months of the year when sunlight is weaker. People with SAD often experience a diminishment of their depressive symptoms over time as the seasons change and light gets stronger in the spring and summer months. Anyone experiencing depressive symptoms during any time of the year should visit their primary care doctor or a mental health professional for an evaluation. To get emotional support and/or to find local mental health providers near you, contact the National Suicide Prevention Lifeline at 800-273-TALK. Q: What are some ways that I can manage my stress this holiday season? A: Stress is quite common during the holiday season as people feel pressure to manage multiple pressures, including gift buying, hosting or attending multiple family and/or professional gatherings, and other social occasions. As a result, many people feel stressed about how to manage the financial aspects of the holidays, handling the expectations of their families and friends and may feel bombarded with obligations during the holiday season. Some strategies that can help to reduce stress include: making a holiday budget and sticking to it, attending social gatherings that you most want to attend and not attending those that aren’t as important, and taking the time to practice self-care, including eating well, staying physically active, connecting with those people who matter the most to you and taking time out for yourself to relax and decompress as needed. Also, don’t forget the value of volunteering your time for causes you care about – giving to others feels great and makes a positive contribution to the community during this time of year. Q: I’ve noticed that lately my daughter is withdrawn at family gatherings, she doesn’t seem to be enjoying our family holiday events the way that she used to, and her school grades are slipping. I am concerned about her behavior. What should I do? A: You are noticing some significant behavioral changes in your daughter and it is understandable that you are concerned. Speaking directly with your daughter to express your love and concern and asking her to tell you more about what she is thinking and feeling will allow your daughter to know that you are there to support her and can help her find a way to discuss any struggles she may be having. Speaking with family members and others who are close to your daughter may also help you understand more about what may be contributing to her difficulties, such as conflicts at school or with friends or family. If she has recently suffered any losses or other difficult experiences, these may also contribute to her withdrawal and other challenges. If these behaviors persist or get worse, it will be important to have your daughter evaluated by her pediatrician and/or a mental health professional in order to address any unmet mental health needs that may be emerging. To locate mental health providers who work with children and teens, you can call the National Suicide Prevention Lifeline at 800-273-TALK. Q: How can I be supportive of a friend of mine who is struggling emotionally due to the loss of a loved one and the constant reminder of that loss over the holiday season? A: The holidays can be a particularly stressful time for those who have experienced the loss of a loved one. There are a variety of ways to be supportive, including spending time together, acknowledging that the holiday season may feel especially hard for your friend and that it is understandable if this is the case, and, if you also knew your friend’s loved one, to let them know that you are thinking about that person, too, and are affected by their loss. Be open to talking about your friend’s experience of loss; but also allow yourself to accept it if your friend doesn’t want to discuss it. If your friend is struggling a great deal and reports that the loss is causing difficulties at home, at work, at school, or in important relationships, it is possible that professional help may be needed to aid the healing process. To find grief counselors or other mental health professionals, call the National Suicide Prevention Lifeline at 800-273-TALK. This time of the year can be difficult for many. Right click and save this graphic to share on social media to help us reach others who may need support this holiday season.